"I love being anonymous now that I've lost nearly 20 stone!" Anthony Hall, 37, who lives on the Isle of Man where he owns a guest house and runs a taxi business, has a truly incredible story to tell of his battle with obesity. 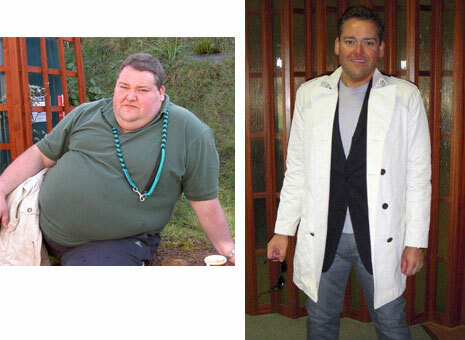 After a duodenal switch operation performed in 2007 by the UK's premier weight-loss surgery team, Phoenix-Health, he lost nearly 20 stone - more than half his body weight. Further cosmetic surgery to remove almost 1 stone of excess skin completed Anthony's transformation. By now Anthony had become very concerned about his weight and he knew he had to do something about it. Over the years he'd been on umpteen diets, and he'd been seeing doctors and dieticians for many years more. At this point he didn't have any other health issues, except for sleep apnoea, but his doctor told him it was only a matter of time before he developed more serious problems. It's now three years since Anthony had his op and since then he's lost a total of nearly 20 stone. 'The anonymity I enjoy now is fantastic! Travelling is far better; I love playing with my children; I ride my mountain bike on the promenade; I roll on the carpet with the baby. At the moment I'm doing renovations on the hotel with a builder friend - it's great to be able to run with sacks of rubble on my back, doing physical stuff. 'It wasn't a typing error,' I told her. Next morning he was on a plane to London. At Heathrow there was a chauffeur-driven car waiting to pick him up and whisk him to Endemol's studios at Shepherd's Bush for a screen test. The reason they'd rushed Anthony to London was because they'd already decided on the people they were picking for the show, but when they saw his photos they decided just had to get him over. Anthony is quick to point out that weight-loss surgery is a tool and not a magic bullet: 'It doesn't fix the other issues that might be going on in your life, and if you want to make it work you have to abide by the rules. 'It was definitely the right decision for me though as I now have a full and active life again. My only regret is not having it done sooner."